Home › Lifting Weights › Apparently Weds. is a popular night at the gym! Apparently Weds. is a popular night at the gym! Who woulda thunk it? Last night, after making the family dinner – I headed to the gym to get my work out on. Normally evenings are a wee bit more populated at the gym, although it has been declining as the Resolution-ers give up. (Which does make me sad.) It seems they got a second wind last night! a) Take a picture to post. Gradually it did open up.. Though I think minutes standing around waiting for a treadmill might just take longer than the minutes ON the treadmill! The treadmill run itself was odd..
Then, on to the chest workout! My personal trainer was nice enough to give me a home-work schedule that specified exact exercises to do. You can imagine the exact equipment I was supposed to use – was all being used. Thankfully, I am nothing if not flexible… (I mean that figuratively.. Physically? Not flexible…) I was able to work the muscle groups in the order that was suggested, just using different weights. It works. Only a little bit sore today, not too bad.. I think my abs are feeling it more than my chest, but both are confirming that i worked out. 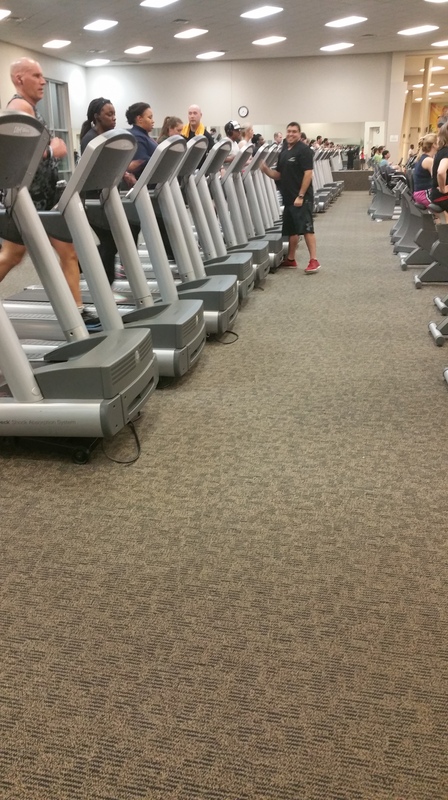 There is nothing more frustrating than being stuck on a treadmill. I tend to do my own spinning workout or use the elliptical. I think what works for me though, regardless of what machine I’m on, is the music. I’ve noticed that during a morning workout I have to listen to a more rap/hip hop-like playlist. Nights are usually EDM or folksy music. Hope you find the secret soon!